Roy Bowe was born in Denver in1916. During his racing career, he was unquestionably one the best drivers ever to come from Colorado. He won 64 main events running in Rocky Mountain Midget Racing Association and won the RMMRA Championship in 1948 and 1949. In addition, he won a total of 12 prestigious feature races outside of Colorado. 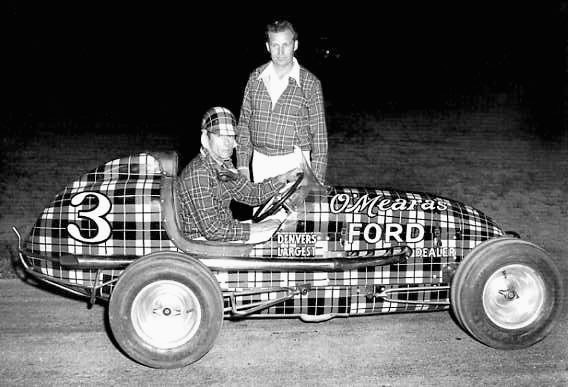 He is also fondly remembered for driving a plaid race car. The list of car owners he drove for included Johnny Boomer, Walt Killinger, Bob Van Buskirk, and Ray Koch. During his racing career he also gained a reputation as being one the best foreign car mechanics in the area, as well as an outstanding aviation mechanic. Bowe also served with the Army Air Transport Command in China, Burma and India during World War II. George Butland actually started running demolition derbies at Lakeside Speedway in the early ‘50’s and went from there to late model racing at Lakeside and Englewood Speedways. He was born in China and learned to speak Chinese better than most locals. Returning from China, he took an interest in auto racing. 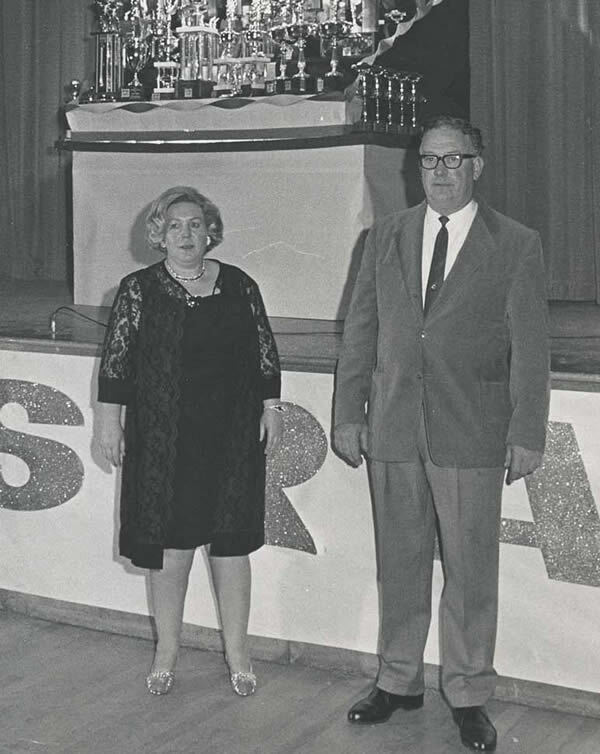 Along the way, he bought and helped established GB Auto Salvage with the help of his son, Pete and his wife, Hilda. It grew into one of the premiere salvage yards in the State. In 1972, he bought CNS with Larry Dechant. 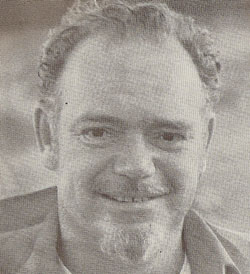 After the 1973 season, he purchased Dechant’s interest in the track. The track suffered several difficult years, but brought in the World of Outlaws Sprint Cars and was able to schedule them yearly. 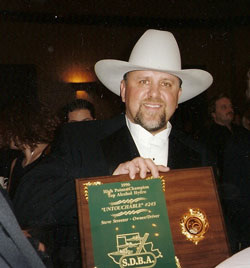 In the years he owned CNS, he received four “Promoter of the Year” awards. He also had NASCAR sanction the track for 2 years. When he accidentally set off several fireworks that went amiss during the 4th of July fireworks show, the track became the hot spot for future 4th of July shows. He would intentionally miss fire the pyrotechnics and fans would go nuts. He sold CNS in 1990, but was always around the track until he passed away. When a racer was in need it was not uncommon for this person to hand them a $100 bill. Stories about this man could fill hundreds of pages. John Whitthar started building roll cages for race cars in the ‘60’s. He has been associated with Howe racing building chassis for both dirt and asphalt cars since 1979. Although he won over 100 main events in his career, he never won a championship but said many times that was OK because he had always raced with champions. 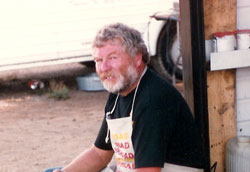 This man has been involved with Colorado oval tracks and racing itself for 21 years and was named to the Colorado National Speedway Ring of Fame in 2008. He said he will always have the biggest family ever because he was always part of the racing community. During his career he worked with Paul Garrison, Butch Speicher, Roland Johns, and many others. He was born in Goodland, Kansas, and started to race with his father who drove a 32 coupe in the ‘50’s. 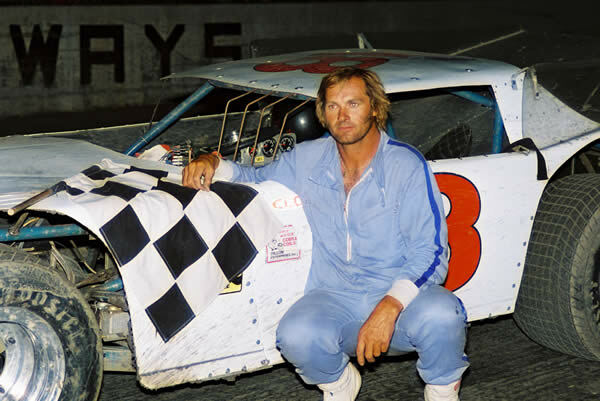 In 1959, he moved to East Lake, Colorado, and began competing at both Lakeside and Englewood Speedways and moved to Colorado National Speedway when it opened in 1965. In 1969, he was drafted into the military service and returned to CNS in 1971 and worked with Paul Garrison’s Late Model which won Rookie of the Year title that same year. Racing fulltime, he competed in Nebraska, Iowa, the Dakotas, New Mexico and California. He got into selling racing tires and parts with Larry Dechant in the late ‘70’s, and becoming a Hoosier Tire distributor. He still oversees CNS’s tire program. You can expect to see him most any night there is a race close to Denver. This gentleman has helped out hundreds of car owners as well as track owners during his career and continues to do so today. For more than 50 years Nick Sanborn was involved with the Pikes Peak International Hill Climb. He was born in the shadow of Pikes Peak in 1935, along with his twin brother Frank. At an early age the brothers constructed what they called “Chugs” and they raced down hills near their home. Nick’s sister, Vera, once said their mother had a Maytag washing machine on the porch. She went out to do the laundry one day only to find out the boys had taken the motor from the washing machine for one of their cars. He became a lover of the Pikes Peak Hill Climb at a very young age and would volunteer to do anything needed including corner worker, barricade movers, and was even asked to drive a tour bus on this famous mountain. In 1954, he and his brother built their first car which took a 5th place finish in the stock car division of the Hill Climb in 1956. Over the years he went to work for Peter DePaulo Engineering in California and the Ford Factory Race Team working on the Jerry Unser car, a Ford Team, a series ran from coast to coast. 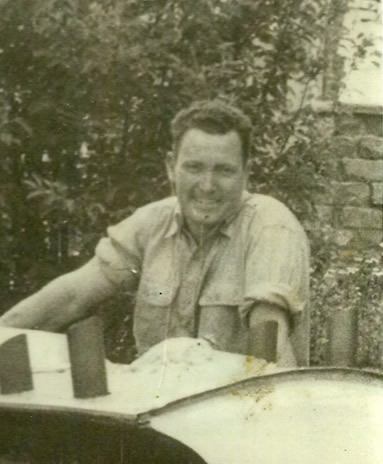 Nick started racing stock cars in the Hill Climb in 1958. He was a five-time winner of the event and took 2nd three times during his 16 years as a competitor. His last win came in the stock division in an Oldsmobile Tornado with front wheel drive. He served as director of competition, and assistant chief steward and held membership on the board of directors for the Hill Climb. In 1987, he was appointed director of operations for the race and later became president and CEO of the organization. He was also instrumental in founding the Pikes Peak Hill Climb Educational Museum. He also was appointed community relations director for Pikes Peak International Raceway. He served as safety communicator for Championship Auto Racing Teams and represented the Pikes Peak Hill Climb as ambassador for other hill climbs in Europe and Japan. He was also a member of the board of director for the United States Auto Club. Nick “Mr. Hill Climb” passed away in 1999. Allen Batt started racing in 1962 and drove a variety of race cars until 1988. He pitted for Hall of Fame member Larry Dechant and bought his first race car from Hall of Famer Wayne Stallsworth. He ran late models at Lakeside Speedway and Englewood Speedway from 1962 to 1967 and ran his car at CNS from 1966 until 1988. He won four track championships at CNS in ‘71,’72,’78 and ‘84 and finished in the top 10 point standings 18 times. During his career he drove cars for Hall of Famer Wendy Windholtz from 1971 to 1974, and for Darrell Smith, George Butland, Butch Speicher, as well as several others. He drove cars known as the 22 Coupe and purple passion, a 1971 Camaro. The 22 coupe was named the “Outlaw.” It was very unique in the annals of local racing for someone to win 4 championships and finish in the top 10 points 18 times. Gene Heffley moved to Denver from Missouri Valley, Iowa in 1957, after serving five years in the military. In 1951, he met and married his wife Gerda. They started a trucking company and had two daughters, Helen and Patti. By 1960 this couple was operating four trucks. A year later he began to operate a salvage business in the Denver metropolitan area and sold parts to two individuals that were building race cars. When one could not pay for the parts, they ended up with the race car. 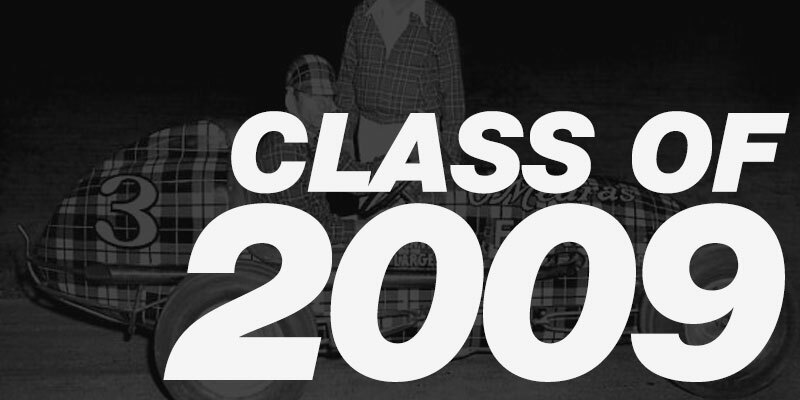 With some help from some friends, Harry McCool and Bart Manley, they ran the #70 car at Lakeside Speedway. That is when he really got hooked. In 1964, one of their drivers was Hall of Famer, Sam Sauer. Later that year they all went to a big race at Hanford, California. It was the first time they had seen a real late model race and he and Gerda decided to build a speedway designed car for late models. But that was just part of the story. In 1965, using the money from their trucking company they purchased an 80 acre parcel of farmland. On that site they designed and built a speedway, and called it Colorado National Speedway. They worked every day possible mid-year until the track was able to run a very short season. In 1966, they raced a full season with the idea of making racing possible for anybody that wanted to participate. The track had four foot retaining walls for the safety of spectators and they continued to make improvements both on and off the track. During the years they added motorcycles, sprint cars and midgets to their racing program. In 1972, after Gene was diagnosed with cancer, they decided it would be best to sell Colorado National Speedway. They were truly pioneers in short track dirt racing. Born in Oklahoma, Leroy Byers’ love for racing began when he attended a sprint car race at the Oklahoma State fair. Moving to Aurora, he struck up acquaintances with several of the midget drivers, climbing over the track fences into the pits on several occasions due to grand stand sell outs. He once landed on Lloyd Axel’s tool box on his way over. His interest would take him to races at the fairgrounds in Pueblo and the track in Brighton. He drove his first midget race in a V-8 ford midget and still owns that car today. In 1952, after attending numerous races in Indiana over a three month stretch, including the Indy 500, he raced in various states running several AAA races during that period of time. After the 1956 season he stayed busy taking photos for over 40 years at various tracks to numerous to mention in this presentation. He continues to do so until this day. You would run into him at tracks in Colorado, as well as venues in Oklahoma, Kansas, Missouri, Iowa, Nebraska, Arizona and New Mexico. He started shooting photographs at CNS after the track was built. 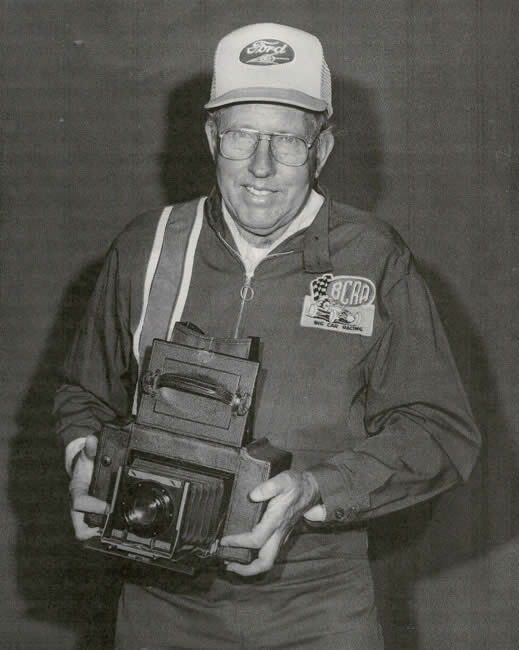 He retired from the U.S. Post office for a number of years which gave him an opportunity to take photos at the races. Although being a race car driver and owner were important to him, being a photographer was where he really found his niche. He became famous for not only his photos, but his extensive racing collection. It seems he kept almost every race car he ever touched and every photo he ever took. Among the racing community he was known as a pack rat but most of us know him by “by golly,” as this was a phrase he always used when he talked to anyone. He has been involved one way or another with Colorado racing for more years than one can remember. Harry Mathews is the true definition of an adventurist, and a lover of motor sports. He spent many years riding dirt bikes both recreationally and competitively. In 1970, he started participating at track events and auto crosses with the Porsche Car Club of America. 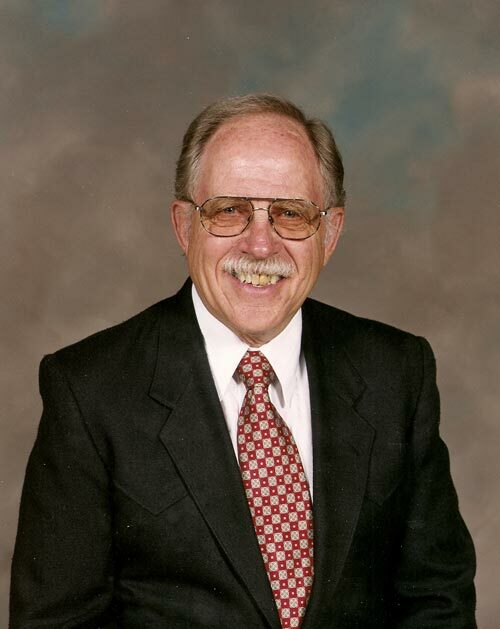 He was editor of the Rocky Mountain Vintage Publication for several years and served several years as president of the Vintage Motor Sports Counsel, the governing body for vintage racing in the U.S. and Canada. 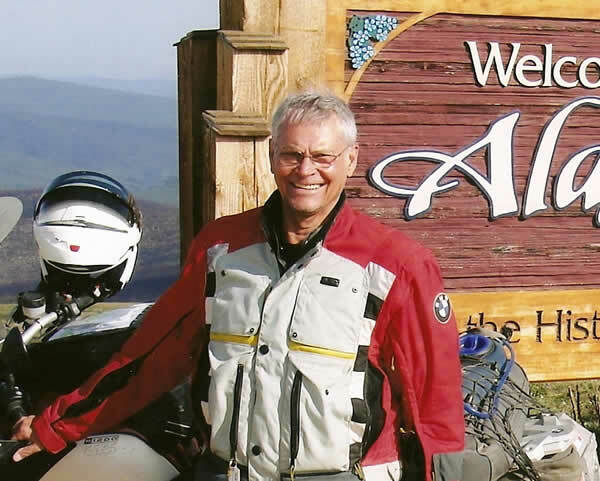 He was also instrumental in the formation of VMC as well as the Colorado Motor Sports Counsel and founded NRA in 1995. He and others initiated talks with the city of Denver that led to the use of Stapleton Airport for racing events upon its closure in 1995 and was involved in spearheading efforts to make vast improvements to Pueblo Motor Sports Park. He was heavily involved with fund raising which will lead to the opening of High Plains Raceway in 2009. Harry was also one of the founders of the Peak to Peak Rally in 2004, which brought sports car enthusiasts from all over the country to Colorado to spend a week in September touring the Rocky Mountain region. The event has raised over $100,000 for charitable organizations. Widely known as one of the foremost experts of collectors of historic McLaren cars, he also collects vintage motorcycles, classic cars and other well known sports cars designed to run on the street as well as the track. A driver and owner of vintage cars he has supported motor sports in Colorado in many ways including offering us his facilities for our receptions. At 70+ years old, he is still active in racing and in 2008 turned his fastest lap at Road America. No one loves more aspects of motor sports than he does. Born in Clarks, Nebraska, Bill Rice built his first car, a 1944 coup, which he raced in Grand Island, Nebraska and Julesburg, Colorado. In 1965, he teamed up with Pete Dudden to field a Mark Williams front engine AA fuel dragster with a Ron Bement body and a super-charged 354 cubic inch Chrysler Hemmie and ran the car at Continental Divide Raceway, Rocky Mountain Dragway, and Thunder Road Dragway. It was one of the first cars Colorado to go over 200 miles per hour in less than 8 seconds. In 1967 and 1968, the team of Rice-Williams set NHRA’s Division Five on fire. They had two new dragsters, one driven by Roger stark and the other by Hall of Famer Mark Williams. Mark won over 90% of his races in 68 and set a Colorado land speed record of 231 miles per hour in 7 seconds. Other drivers for Rice included another Hall of Famer, Alan Bockla. As for the reason for their success in 1958 they all said, “We’ve got Bill Rice.” From 1972 – 1975 he teamed up with Pete Colvin with a single-seat desert racing VW. In 1980 Frazier and Rice became only the third drag racing team to travel on a national level. They competed in 33 NHRA races as well as races with other sanctioning organizations. 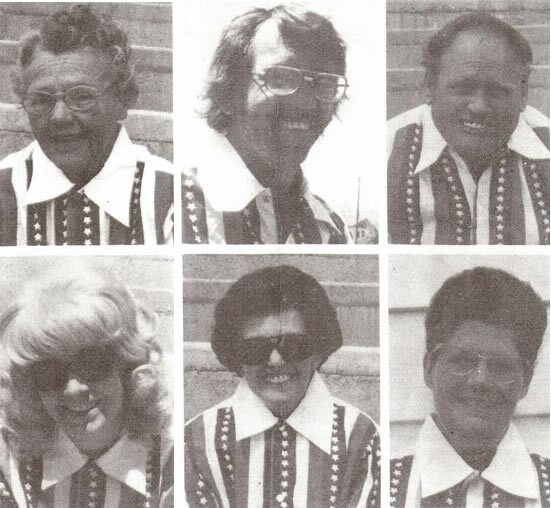 A number of top drag race champions were associated with Frazier and Rice in 1980 and 1981. In 2002, he joined his father and began racing single-seat off road buggies again. The Codner family truly entered motor sports in the year 1950 when they purchased a speedway in southwest Denver, known as Englewood Speedway. The family’s dad did not tell them he had bought the track. His wife found out about it when she read it in the newspaper. Englewood Speedway had been over shadowed by the popularity of Lakeside Speedway and it would be a very difficult path for this family to bring the Speedway to prominence as far as the Rocky Mountain region was concerned. The hot rod and roadster cars began running at the dirt track and than a variety of cars including roadsters, jalopies and midgets. They revamped the Speedway refiguring the grandstands from the south side to the north side, and installed higher catch fences and better guard rails but most importantly they converted the track from dirt to asphalt. In the early ‘50’s stock cars took the place of the featured cars running at the track and they began to feature added events to the races such as demolition derbies and automobile soccer. With the father passing away in 1961, a wife and one son was left to run most aspects of the track. Another son was just returning from the military but did not take an active interest in the track until the late 1960’s. The track had already become a 1/3 mile paved oval at that time. It was this son, who brought back with him something he had seen in California called figure eight racing. Fans came to the track in huge numbers to see the wildest racing yet. Late models and super modifieds were also a popular part of the track program. It was than the Speedway coined its catch phrase “the wildest show on wheels.” Each member of the family had their job. The mother was the matriarch sat back and oversaw everything. One son became the general manager and managed all on track operations, and other family members sold tickets and worked in the pits. Within a few years, Englewood Speedway became the most popular track in Denver and received national recognition as one of the top short tracks. In 1965, The Englewood Racing Association took over the super modifieds and within two years figure eights and late models ran every Sat. night during the summer and super modifieds and figure eights ran every Sunday night. Thanks to the figure eights, the track became a big hit but unfortunately with expansion the land that the track sat on was purchased for an office warehouse development in 1979. The family had done a great job of developing a track that was recognized nationally. Born in Sioux City, Iowa, Steven Streeter is now a longtime resident of Denver. He is now CEO of Steel Lock General Fence Contractors. His racing career really got started in the late ‘60’s and early ‘70’s, when he raced snowmobiles for Team Polaris. In 1979 through 1989 he raced flat bottom boat lake racers as a hobby. In 1991, he became involved with the Rocky Mountain Drag Boat Association. During this period he fielded a boat called, “Breathless I” and in the Southern Drag Boat Association ran boats named “Breathless II” and “Untouchable” from 1991 to 1996. Jerry Van Dyke was born in Denver, Colorado, in 1934 and never lived anywhere else. His uncle took him to a midget race at Lakeside Speedway in 1946, and he was hooked on racing. His hero became Johnny Tolan. He sat in the bleachers on the south east side of the track with a number of other young fans, several of whom he knows to this day. All of a sudden, the midget association opened their pits to those 16 and over. Thrilled to be in the pits and working on cars, his desire was to become a famous midget car driver. But that was not meant to be. He then decided to race jalopies at Lakeside Speedway for owner Charlie Wisherd. Driving was not to be his life long career. He bought a late model, encouraged by Wisherd, and ran it on the first Colorado late model circuit. He drove the car along with Hall of Famer Sonny Coleman and Jerry Malloy and the machine had some success on the track under all three drivers. However, he would find himself heading another direction as far as racing was concerned. 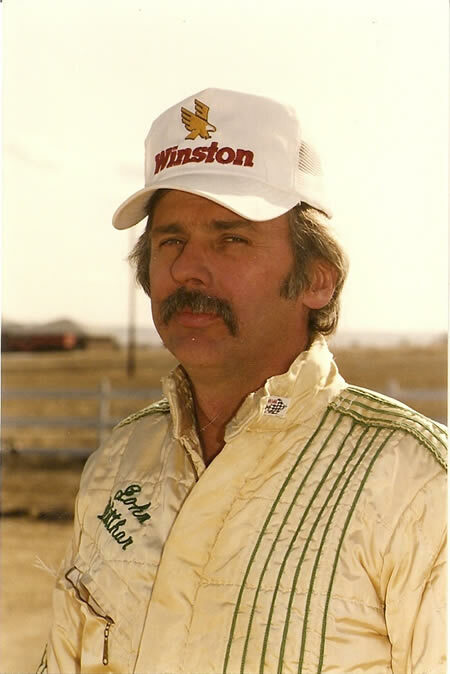 He did marketing and advertising work at CDR (where he first announced), Englewood Speedway, Colorado National Speedway, Rocky Mountain National Speedway, and Pikes Peak International Raceway. He announced at all of these tracks and several others over the span of a career lasting nearly 50 years. At Pikes Peak International Raceway he interviewed all of the IRL stars and most of the up and coming NASCAR Sprint Cup stars. He was involved in advertising agency ownership for over 40 years and his agency merged with the Sam Lusky agency and formed the largest advertising agency in Denver for 4 of the 8 years he was there. He then formed a smaller agency which he ran up until his death in 2009. He performed in the Denver Post Operas from his teen to young adult years. He competed in Scottish games and announced them for nearly 20 years. He once performed in a Broadway play that came to Central City. This was a man that ate, breathed, and drank racing. His love for all types of motor sports was his real passion. 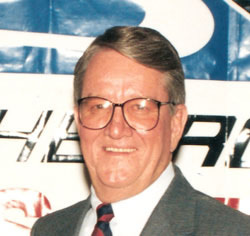 Jerry, who passed away in 2009, should also be remembered for being one of the founders of the Colorado Motorsports Hall of Fame and the individual who brought the organization back to life in 2004 after a 24-year absence.